He was the only cat in the entire place mournfully meowing for all he was worth, in addition to sticking his entire paw up to the shoulder through his cage bars and waving it around maniacally, positively pleading for release. Naturally, he caught our eye. But then the clever volunteer sidled up and slyly informed us that Socrates only behaved that way because he loved to play. Oh, and also, did we know what a lovely, friendly cat he is? And then she went in for the kill--asking us if she could take him out from the cage so we might pet him and just play with him a bit. To which Beeper, of course, nodded so vigorously I thought he might give himself some sort of shaken-baby type of injury. So, there we were--in a little room, with Socrates, and a few toys. And I am sure you can only imagine what happened--Socrates did his damnedest to show us how very good he is at playing with little boys who are 5 years old and making them dissolve into hysterical giggles, and then he sidled up to the mama, rubbing his head against her, looking inquisitively into her eyes, and asking, "Meow?" A real professional, I tell you. You can see now, we didn't even have a chance. Resistance was futile. We just rolled over and said, "We'll take him." I think the whole visit took about 10 minutes from entry to committing to adopt Socrates. We were like injured wildebeests come to drink at the lion's watering hole--easy prey the moment we walked in. But he is the perfect cat for us. And I do mean, perfect. He is so adoring and affectionate and ridiculously tolerant of Beeper and most importantly, does love to play (endlessly). 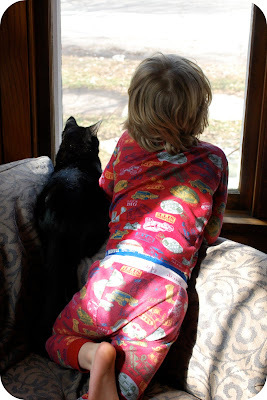 He and Beeper have been inseparable--tossing and chasing balls, reading and cuddling in Beeper's teepee, and even watching birds together out the window. Socrates was a stray kitty. He had been at the Humane Society an entire month--hard for me to believe no one else found his manic meowing and paw waving as irresistible as we did. And Socrates was the name he came to us with--and despite my offer to name him BatKitty, Beeper was adamant that we keep the name Socrates. We really do not know why he was named Socrates...perhaps because he does love to engage in dialogue (if you talk to him, he always has something to say back to you). Whatever the case, he is part of our little family now. Curled up in a patch of sunshine as we speak. A bit of good fortune found at the Humane Society (and like public libraries--isn't the Humane Society such a good, good thing? ), even if we were easy prey. A very happy story to cheer the day! Socrates is obviously a devotee of "The Silent Miaow" by Paul Gallico. I recommend you read it asap so you can at least put up a respectable and honourable struggle against the inevitable. I'm so happy you found such a perfect addition to your family! What a great and heart warming story, and yay to you for rescuing Socrates - It sounds like it was meant to be. Cats really do make the world a happier place don't they. Congratulations you guys! I was wondering if you were going to fill the pet vacuum that dear old Phoebe left open. You know they make me sneeze like crazy but he sounds lovely! That photo of them both looking out the window just gets me. What a lovely cat! What a wonderful addition to your wee family. Congrats to all. Congratulations on your new family addition! Sounds like a cool cat. welcome to the family, socrates! 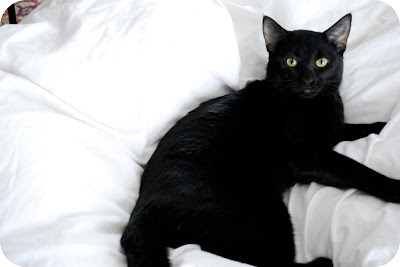 i love black kitties! i had one for 17 years, from kitten to old age. they are the best. sometimes the perfect addition to your family is just waiting for you, waiting to wave hello. That is just beautiful! Beautiful words and beautiful photos! I love the picture of Beeper looking out the window with Socrates! So adorable!! The world feels like a better place when pets and people find each other. Yeah to you for having an open, loving heart and noticing that kitty needed you too. As the owner of 2 black shelter pets I learned that they are the last to be adopted. Your kitty looks perfectly snuggly! How Purrfectly wonderful. We got our cats at a similar place after our first cat passed away after 17 lovely years. 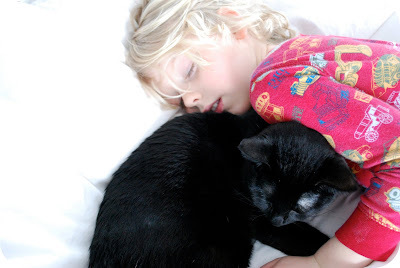 Cats definately choose their owners, Tilli our cat was Just the same way! She had the loudest longest voice, and when we adopted her, the easiest way for the workers to describe her was the noisiest one and they knew exactly who we adopted! (Tilli is short for Chantilly which means Brave Little Maiden).